, the folk rockers closed out the legendary festival with their first headlining slot at the gathering. Singer Marcus Mumford assured the massive crowd, "We came for a party," as the group launched into their global hit "I Will Wait," according to the NME. While they didn't comment much on Dwane's health scare for most of the set, at one point Mumford said, "So we've been a band for coming on six years, The Rolling Stones have been together for a lot longer than that," referring to Saturday night's highly anticipated Glastonbury debut by the legendary rock group. "The big difference between them and us is we've played Glastonbury four times." He then added, "Also, Ted's f---ing alive isn't he!" 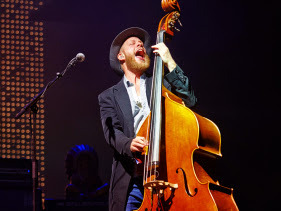 Dwane, shorn of his signature long hair, wore a wide-brimmed hat to conceal his surgery scar and after performing "Roll Away Your Stone," Mumford requested that the crowd join him on "Awake My Soul" to, "celebrate the fact that Ted is still here." The set ended with an all-star jam on the Joe Cocker arrangement of the Beatles' "With a Little Help From My Friends," with help from members of Vampire Weekend, the Vaccines and First Aid Kit. of North American dates in August and September, including rescheduled shows in Texas, Louisiana and Kansas.